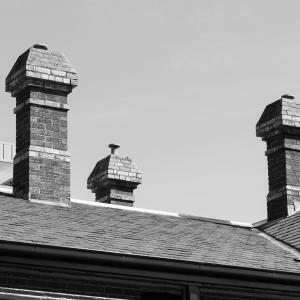 Peter Andrew Barrett provides a range of heritage services to architects, planners, government authorities, councils, and the owners of heritage buildings and sites. 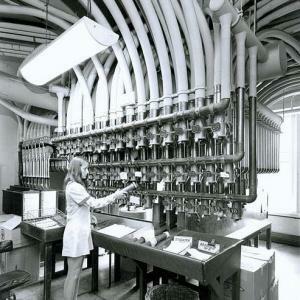 Following are a few select projects. 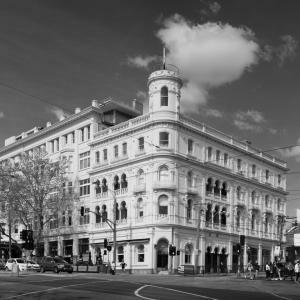 Victoria Parade is one of several boulevards that radiate from the city, and is recognized to be of heritage value to Melbourne. 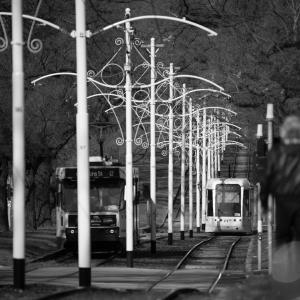 The works involved realignment of bus lanes and bicycle lanes that prioritized public transport and improved cycling and pedestrian connections, while retaining Victoria Parade’s tree lined boulevard character and minimized impacts to its historic bluestone channel and kerbing. Peter Andrew Barrett undertook a heritage assessment of the works and made recommendations to minimized physical and visual impacts. 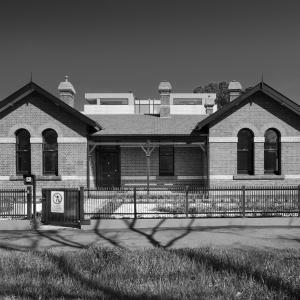 The Parkville Police Station is recognized to be of heritage significance at a State level, as a rare example of a police station of a residential scale and character built by the Public Works Department of Victoria in the 1870s. Metropolitan police stations of this period tended to be more substantial, and the smaller scale of the Parkville Police Station is more consistent with country stations. 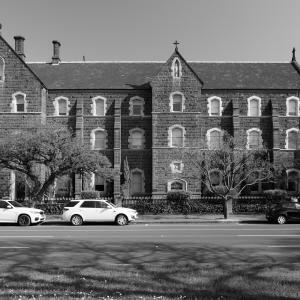 As part of a proposal by its owners to redevelop the site as part of a residential complex, Peter Andrew Barrett prepared a heritage impact statement, which assessed the impacts of the proposed development, and put in place recommendations that have been adopted by its architect, MAP Architecture, which have minimized impacts upon the heritage building. 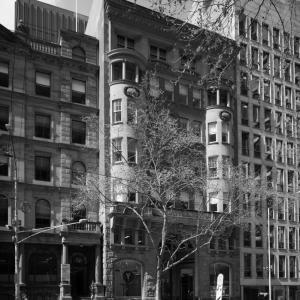 The Queensland Building, situated near the top of a rise in William Street, was built for the Queensland Insurance Company in 1913. 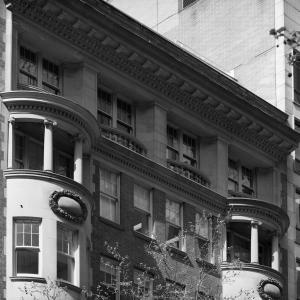 Its architects, Butler and Bradshaw, designed a building of beautifully carved stone ornamentation on a well-proportioned and imposing façade. 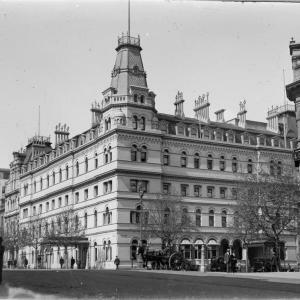 The Queensland Building, with neighbouring Scottish House and the Australian Club, form a group of three majestic Victorian and Edwardian buildings that line the east side of William Street south of Little Collins Street. 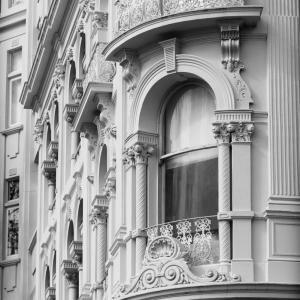 The elegant façade of the Queensland Building reflects the grandeur of the period in which it was built, when Melbourne dominated the commerce and trade of the nation, and the city was the capital of the newly formed Commonwealth of Australia. 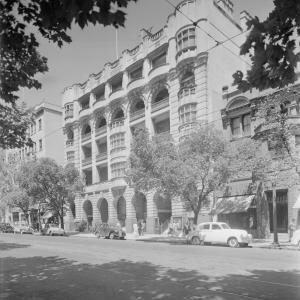 The history, with early photographs and original architectural drawings, forms part of a historic display in the foyer of the Queensland Building. 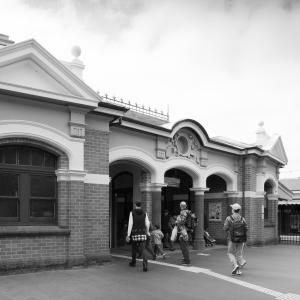 As part of the Regional Rail Link, Footscray Railway Station was upgraded to provide two additional platforms and improved passenger amenity. 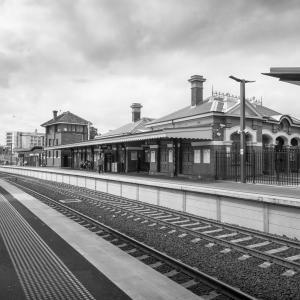 Peter Andrew Barrett prepared a heritage impact statement that assessed the impacts from the proposed works on Footscray Station, which is recognised by the Heritage Council of Victoria to be of cultural significance to the State of Victoria. 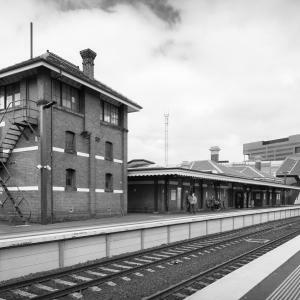 Recommendations in the heritage impact statement were adopted by the Department of Transport, which have retained the historic character of the Footscray Railway Station, while upgrading the complex to the standards needed for a modern transport interchange. 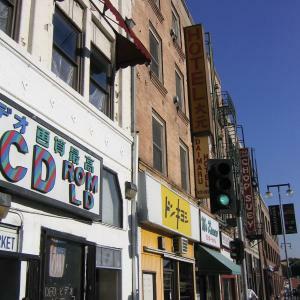 Little Tokyo, centred at East First Street in downtown Los Angeles, has been the cultural, religious, social and commercial centre of the Japanese American Community in Southern California for one hundred years. 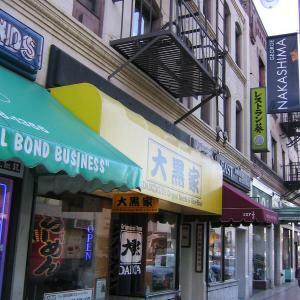 As part of a cultural resources study, community consultation with the Japanese American Community provided an understanding of the forces that shaped the urban landscape of Little Tokyo, and policies have been put in place to ensure that its heritage values are preserved in future development and the ongoing revitalisation of downtown Los Angeles. Peter Andrew Barrett provided heritage consulting services to the project manager, TBA West Inc. 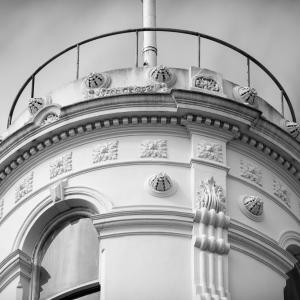 The George is a commercial and residential complex in St Kilda that contains a number of former hotel buildings dating from the late nineteenth century. 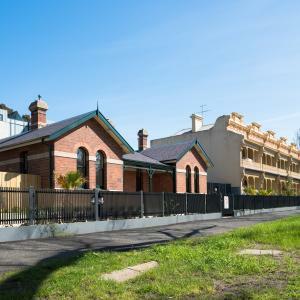 This conservation management plan was prepared for Victoria Body Corporate Services Pty Ltd, who is responsible for the management of the complex. 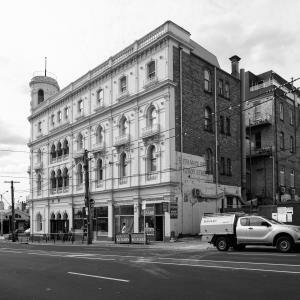 This purpose of this conservation management plan was to assess the heritage significance of The George and to put in place policies for its future conservation and management. 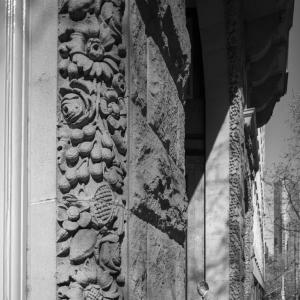 Peter Andrew Barrett is a qualified architectural historian, heritage consultant, and writer on architectural and urban history. 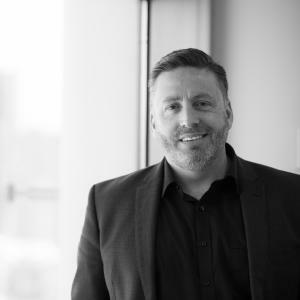 He is a graduate in Architectural Technology from the Royal Melbourne Institute of Technology (1993), and is a Masters graduate in architectural history and conservation from the University of Melbourne Faculty of Architecture, Building and Planning (2002). His Masters’ Thesis ‘Building Through The Golden Gate: Architectural influences from trans-Pacific trade and migration between Australia and California 1849-1914’ (2001), supervised by Dr Miles Lewis, is recognised as having shown that architectural connections between California and Australia were actively fostered from the mid-nineteenth century, and that these engendered a trans-Pacific exchange of architectural ideas, technologies and people. The heritage practice, Peter Andrew Barrett, was established in 1997. 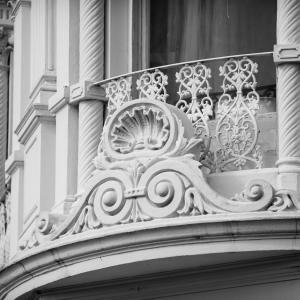 Its aim then, as it is now, is to provide prompt, professional heritage advice on the conservation of heritage buildings and places. 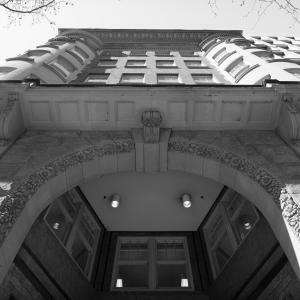 The client base of the firm includes State Government departments, Local Government, property developers, architects and the owners of heritage buildings and sites. 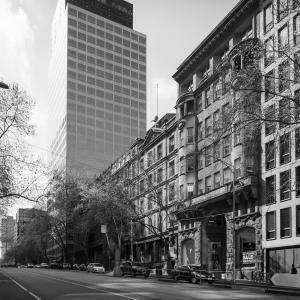 During the 2000s, the practice undertook work in Los Angeles and San Francisco, and in 2005 was a recipient of an Austrade exporters grant for the provision of heritage consulting services to the United States. Peter Andrew Barrett was awarded in 2014 a Lord Mayor’s Bronze Commendation for its longevity and success as a small business within the City of Melbourne. 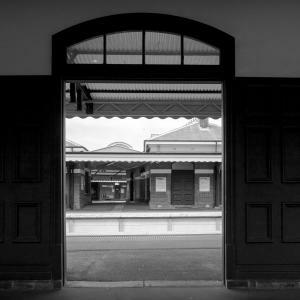 Peter Andrew Barrett lectured and tutored in architectural history and design in the 1990s and 2000s at the Royal Melbourne Institute of Technology, the University of Melbourne, and Council of Adult Education (CAE). 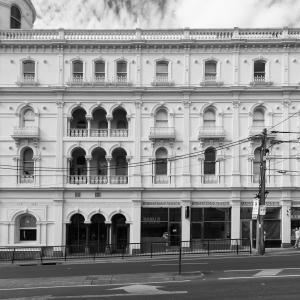 Peter Andrew Barrett’s Her Majesty’s Collingwood Stockade: A Snapshot of Gold Rush Victoria was published in Provenance in 2007. 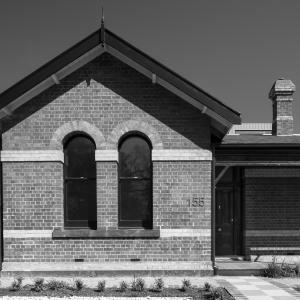 His other published works include exhibition catalogues, a monograph on the architect and academic Leighton Irwin, and as a contributor to The Melbourne Design Guide. Since 2013 he has written articles on architectural and urban history on his online forum, and contributes to commentary on heritage matters in the media. In 2011 he was invited to speak on architectural conservation at the California Preservation Conference in Los Angeles. Peter Andrew Barrett co-curated with Simon Gregg the exhibition The Impermanent City: The rise and fall of Melbourne’s skyline, at the City Museum at Old Treasury (2008), and has also been involved with other exhibitions including Re-Built Environment: imitating Melbourne architecture (2006), also at the City Museum, and Jet Set Melbourne, at the City Gallery Melbourne Town Hall (2014). He is a member of the Australia ICOMOS (International Council of Monuments and Sites) Pacific Heritage Reference Group, which provides advice to the Executive Committee of Australia ICOMOS on world heritage issues within the Pacific region. 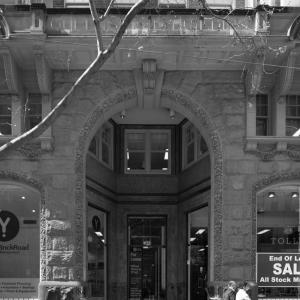 Society of Architectural Historians of Australia and New Zealand. 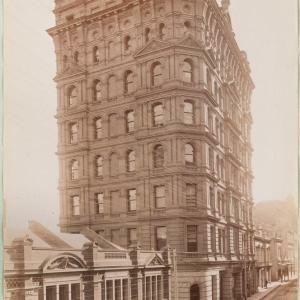 Stalbridge Chambers was one of a number of multi-level office/commercial buildings erected in Melbourne during the Land Boom towards the end of the nineteenth century. 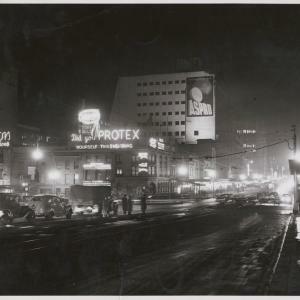 Illuminated signage was a prominent feature on buildings at this gateway intersection by the time this photograph was taken around 1950. 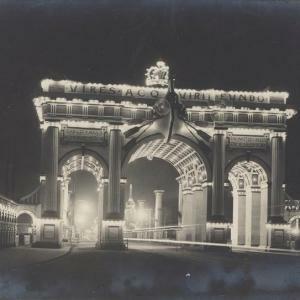 The Municipal Arch, at the southern end of Princes Bridge, was one of several temporary arches erected in Melbourne to celebrate the opening of the first Parliament of the Commonwealth of Australia in 1901. 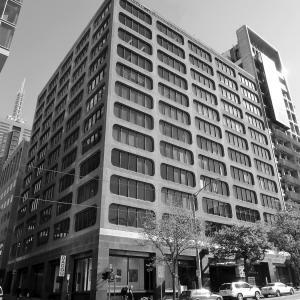 Completed in 1906, the Melbourne Mansions building at 91-101 Collins Street, Melbourne is thought to be the first block of residential flats within the city. 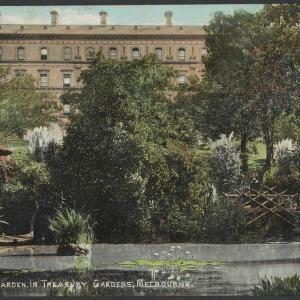 Designed by William Guilfoyle, curator of the Royal Botanic Gardens, the Japanese Garden was opened in 1902, and was set out around an existing ornamental lake in the Treasury Gardens. 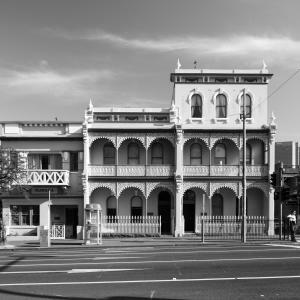 Menzies Hotel traded at this site at the southeast corner of Bourke and William Streets from 1867 until 1969.